If you've already installed a newer version of iTunes, you can download this version of iTunes on your Mac, PC 32-bit or PC 64-bit and run the installer. After installation is complete, you can continue to deploy apps with iTunes. You won't be prompted to download new versions of iTunes after you install this version. Installation packages for Mac and PC (32-bit and 64-bit) are available for download on the support page. After the installation, most users will need to rebuild their iTunes Library. To do this, hold down the Option key when the app launches and in the dialog window that appears choose "Create Library...". Give the new library a name that's different to your existing library, and then migrate over your albums using the Add to Library... option under the Files menu. 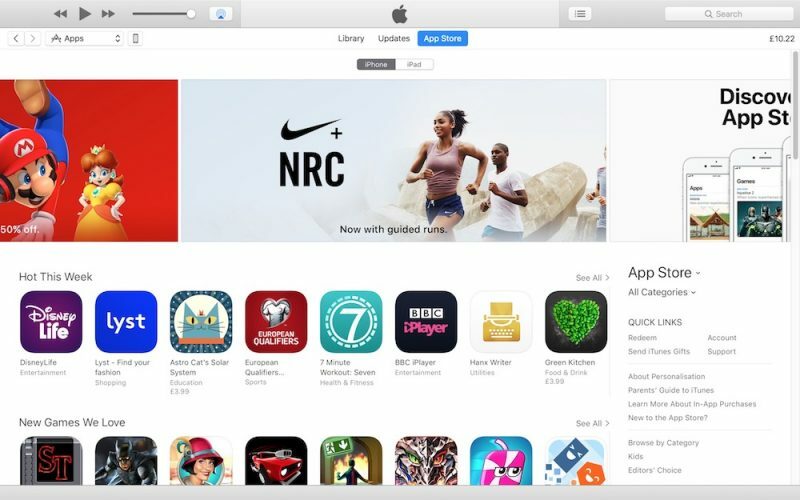 Apple released iTunes 12.7 in September and said the new version was designed to focus solely on music, movies, TV shows, podcasts, and audiobooks, which was the reason behind the removal of the built-in App Store. Following the change, apps and ringtones could only be downloaded on an iOS device. This special "business edition" of iTunes includes compatibility with iOS 11, iPhone 8, iPhone 8 Plus, and iPhone X. It's not clear how long Apple will offer iTunes 12.6.3, and the company does not provide technical support for this version, but for those who want the functionality it could be a useful makeweight until Apple comes up with an alternative solution. Well I think the best solution would b to make a separate desktop application for ios device management (except music) for backups and app purchase and syncing. They should have never removed it. ...without offering an alternative. iTunes is a bloated mess, so removing it makes sense, but they at least need to provide a viable way to keep backups of Apps so that people with slow internet connections don't have to download everything again and again. Are those declarations for real? Just put back the feature already. For years people have been complaining about iTunes being bloated. They slowly start removing features that are rarely used or needed. Yet as soon as they do people complain that something is being removed. They're not going to win. The solution is not to remove functionality, but to split it. There really ought to be a "boring" application that can do things like installing apps, backing up devices, restoring them etc. without iTunes. Stupid decision to remove it in the first place. I like to keep the app ipa files on my computer just incase apple removes them from the app store. Basically going back to what they had years ago with iSync. Why would we ever want 32 bit apps back and an old iPhone design? Because headphone jack is still universally useful compared to either Bluetooth or Lightning, which are still far from it. Because some 32 bit apps are not updated, will never be but are still quite useful. Neither holds Apple back in any way, nor affects anyone who wants to go all-in with Bluetooth, Lightning or only 64 bit apps. Such stuff would simply make Apple products more useful for those that desire such utility. Take very simple, very common use-cases. For example, ever fly? Ever want to watch the seatback live video instead of whatever you might have on the iDevice? How many mainstream airlines have a Bluetooth connect option for the audio? How many have a Lightning jack for the audio? Hot girl/guy sits next to you. You strike up a conversation. She/he wants to share a great song on their phone with you. It's not an Apple phone. Did you bring the adapter? If not, tough luck. Or instead of listening together, it turns into a your turn: my turn. How about watching a movie she has on her device together? Tough luck. Visit a client. They need you to jack into their audio equipment to hear the latest ad/video/conference/broadcast/etc. They're NOT an Apple shop. Offend the client by ridiculing their lack of Apple equipment? Delay the conference so that maybe their IT guy can find some way to jack you into their equipment? Just miss out and look like a disconnected consultant/partner? This stuff is everywhere. Can't even work wired between iPhone and Macs- must have the adapter or 2 (TWO!) sets of headphone. It's not "the future" per se, it's still just an ongoing usage hassle. Carry the adapter everywhere and/or be sure this other thing is charged too. Just roll with what you can't do because of the rampant incompatibility outside of a narrow Apple bubble? "But, but, but the other guys are dropping the headphone jack too." Yes, but they are NOT adopting Lightning. And Bluetooth still has so many limitations in sharing, in quality, etc. On the app issue, useful apps are useful apps. Sure it would be great if every app was upgraded to be 64bit but neither Apple nor us consumers have any control of that. And if the developer is closed or just doesn't care anymore, that doesn't make their app any less useful to those who use those apps. And there's not always substitutes for every app. I realize that some of us seem compelled to go with a "whatever Apple thinks/does is the one and only right way for ALL" stance, but I, for one, still subscribe to an earlier Apple decree: "think different" which sometimes applies pretty well when Apple's thinking is working against a consumer's utility. We should be able to think objectively and share our opinions and not necessarily be wrong just because they don't sync with what a corporation has decided... even THAT corporation. In matters such as the headphone jack and 32-bit app, NOBODY is negatively affected by keeping either- not Apple, not other consumers who only want "the future", etc. However, those who want "the past" can be greatly affected by trying to do what so many do- just roll with it, because we want the whole bad enough to try to roll with the choices that affect us negatively. Some spin that as a unit sale vote in support of Apple's choices but I think that's really a vote to just tolerate the headaches of some Apple choices because we want "the rest" bad enough to do so. I'm quite the Apple consumer myself. I still HATE the headphone jack decision. It's a terrible fragmentation (driven only by a choice, not being forced there (no "thinner" is not a force)) that puts a burden on us consumers for at least many years to come. There is NO good way to "roll with it" and have any "the future" option work as well. Embrace Bluetooth and reject being able to use the buds with you in many common situations. Embrace lightning and not even be able to use your best headphones with Apple's own Macs. Carrying adapters is a poor substitute to just leaving a tiny hole and tiny channel in for those "old fogeys" who want to keep using the most ubiquitous standard port for audio in the world. Carrying more than one set of headphones to cover all bases is a poor substitute for 30 seconds of "thinner & lighter" spin at the big reveal. How long until either Lightning or Bluetooth is as available on everything? Never for Lightning and it seems like it will be a very long time for Bluetooth. But hey, let's celebrate our difficulties because a corporation knows best for ALL of us. And let's ridicule our fellow consumers who don't just tow the company line because a concept like "think different" only applies when it aligns with whatever the corporation wants us to buy.